Now that it is Spring we recommended reading books about planting seeds. Here is a great gardening kit and some gardening tool kits for kids we highly recommend. This kit includes three biodegradable pots, three seed packets, and quick soil mix. Just follow the instructions and the kids can watch for the plants to sprout. 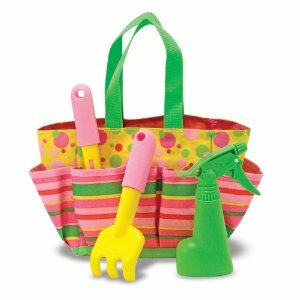 With this kid-friendly garden tote, complete with tools, getting help in the garden just got easier! The plastic tools are just right for little helpers and easy to keep organized in this durable fabric tote with sturdy woven handles. It’s fun to help in the garden when you have a set of sturdy, easy-clean tools specially designed for young gardeners. Tootle helps keep them all organized with convenient side pockets in this made-to-last fabric tote with durable woven handles. Features: Durable fabric with wooden handles are recommended for children ages: three years and up. « How Do Seeds Grow?